Don't think the concern with clothing fashion among today’s Japanese youth is anything new. Judging from the amount of attention given to kimono in almost every genre of classic woodblock prints — geisha, kabuki, samurai, even sumô — stylish apparel seems to have been a cultural obsession, at least of the merchant class, as far back as the middle of the Edo period. At that time (as it is now) the city of Kyoto was the center of silk dyeing and kimono design, and its inhabitants have always put great store in dressing well. Thus, it is only natural that ukiyo-e publishers in neighboring Osaka, hardly a bobbin's throw from Kyoto's famed Nishijin kimono district, would go to extra great lengths to celebrate lavish costuming. Kimono in Osaka prints rival in visual impact the stage and teahouse originals, dazzling you at turns with designs of writhing beasts, intricate landscapes, and crazy-quilts of color and pattern, all sharpened by metallic pigments, mica, lacquering and blind embossing. The printed kimono exhibit so much deluxe detail work, in fact, that one might conclude the publishers' intention was to glorify only the kimono industry ... and/or the woodblock carvers and printers. Fig. 1 is a portrait by Harukawa Goshichi (active c. 1810s - early 20s) of the courtesan Kômei, working for a geisha establishment in Osaka's Shinmachi entertainment district. 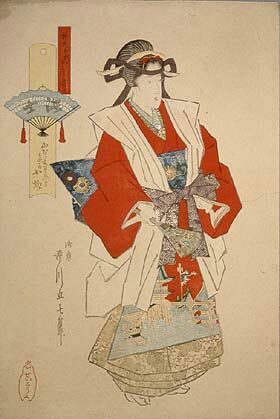 Admittedly, Ms. Kômei is shown as she appeared in a special once-a-year costume parade (c. 1820), but clearly her supporters had no inkling of the concept made famous much later by Coco Chanel; to wit, "Dress impeccably and they remember you — dress gorgeously and they remember only the clothes." In fact, the beauties in Osaka prints might as well be nameless mannequins; it is only their striking kimono — for which some sponsor paid a pretty yen — that stand out as alluring and memorable. The faces of stage idols, of course, were carved with more individuality, but the focus of the print still centers on the garments. Fig. 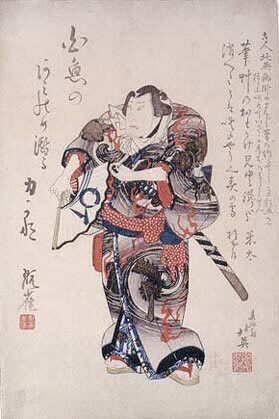 2 is a kabuki piece from 1837 by the Osaka artist Hokuei (active c. 1827-36). 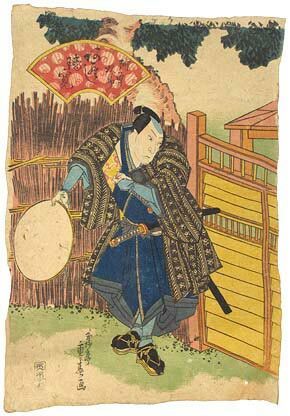 In addition to spotlighting a performance by Nakamura Utaemon IV in a sumô role, the print serves as an announcement of the death of Hokuei. However, what the viewer comes away with is the image of the striking dragon kimono, and a feeling of wonder at all the technical finesse that went into making it so arresting. Fig. 3 is the left side of an Osaka kabuki diptych designed by Shigeharu (lived 1803-53; active 1821-41). What tickles the fashion sense here is that it is printed on paper that has been exhaustively manipulated to look like silk crepe. Durable, actual crêpe de Chine — called chirimen in Japanese — was used throughout the Edo Period for kimono and obi, and then for a brief period at the turn of the last century for children's books. But starting in the middle decades of the 19th century, print publishers, both in Osaka and Edo, seem to have occasionally imitated the material. For chirimen-e, the same woodblocks are used as for the paper edition, but by the time the crimping processs is finished (see chirimen-gami), the piece has shrunken considerably. Fig. 3 measures only 19 by 27 cm, or about 3/4 the size of a standard oban print. On the other hand, the concentration of colors is richer and denser than anything possible with normal paper, and imbedded in the pint is an extra dimension of sensuality. This article (with a different image for fig. 1) originally appeared in Daruma, no. 16, Autumn 1997. Copyrighted © text and pictures reprinted with permission.